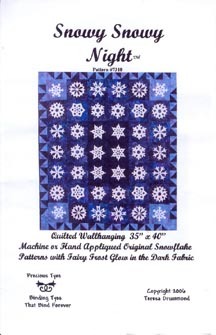 I have decided to join a Swap and a Challenge this year to keep me motivated and quilting. The first one is the Mug Rug Swap. I plan on revisiting my various totes of fabric for the Mug Rugs. 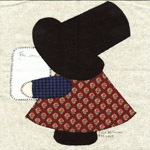 I have all the Nifty Fifty Illinois Quilt blocks that were swapped in our 29 exchanges up on the Illinois state page. We got a large variety of quilt block patterns representing Illinois. The most popular pattern made was the Log Cabin quilt block which represented the one room log cabin in Illinois where Abraham Lincoln was born. There is another log cabin that Lincoln’s family moved to in 1830 but Abraham only visited this cabin since he had already left to start his own homestead. We recieved some very original quilt blocks which represented Abraham Lincoln himself…not just of his home. My favorite is the one which was done in Redwork… Another one is Sunbonnet Sue wearing Old Abe’s famous hat. And of course Chicago needed be represented since it makes Illinois famous with it incredible shopping and tourist sites. What better way to represent Chicago then by having Sunbonnet Sue visiting the city as she did in our Nifty Fifty 25 Swap. Five years ago there was a stray cat at my in-laws house. She was leary of us but very sweet. You could hear her purring from across the yard if you talked very nice to her. You could tell she was starving because my father-in-law threw out a pizza crust for her and she grabbed it and ran. She hid under the jet skis and I have never seen a cat eat anything sooo fast. My husband had a lot of patience that weekend and was able to catch the stray cat. 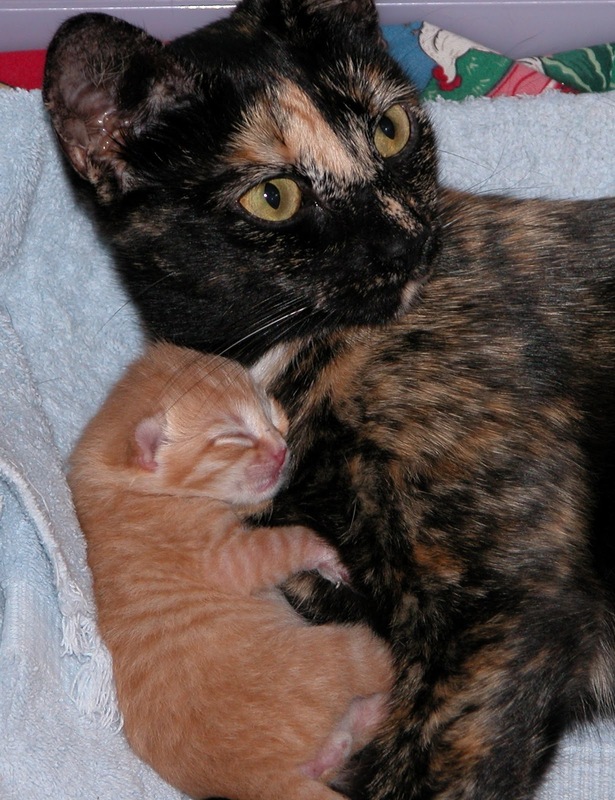 We called her Tootie and within a few weeks this skinny little thing had four kittens. We had no idea she was pregnant!!!! and one gray tabby we named Maggie. They are real characters and they both LOVE treats and Quilts!! 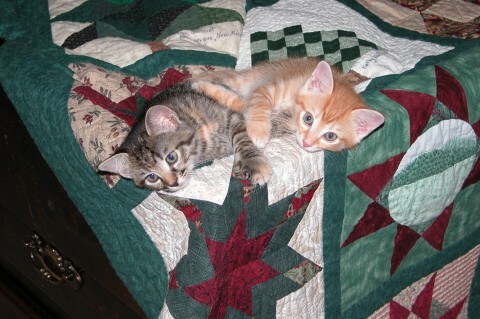 When they were kittens I received a treat jar from my sister. They knocked it off the table tying to open it and it broke. I was so upset!!! This week….I found the exact treat jar at a thrift shop. Maggie immediately remembered it after five years and right away tried again to open it. After Maggie spent a lot of effort with no results, I finally helped her by tipping open the lid. Her brother Joey waited until he heard the lid open and then he came over to reap his sister’s hard work…….Maggie patiently stepped back while Joey tried reaching in to get a treat but it was more difficult then he thought. Finally he stuck his whole head in the jar to find one. Maggie also got her treat by sticking her head into the jar. I made these mittens for Christmas presents this year. They are easy and work up really fast. They are so comfortable that I made myself a pair using double strands of Wool Ease instead of the Homespun yarn I used for the little ones. Enjoy!! Please let me know if you have any questions about the pattern. Can substitute two strand of Lions Wool Ease for the same result. Increase 4 stitches evenly across the last row of ribbing. Continue with stockinette stitch ( K one row P one row) for a total of four rows. At the beginning of the next knit row CO four stitches. At the beginning of the next purl row BO four stitches. Continue in SS for 5 ½”, (6 ½”, 7”, 7 ½”) from the beginning or desired length. Sew the sides of the mitten together by starting at the bottom of the ribbing and stopping at the CO and BO stitches. Then sew the top sides of the mitten stopping at the CO and BO stitches. This will be the thumb opening. You can make a very small child’s mitten using the same pattern but casting on 18 stitches and increasing 2 stitches on the last row of ribbing. Do SS for two rows after the ribbing and then CO and BO 2 Stitches. Cont in SS until the mitten measures 4 to 5 inches from the beginning.